Are you a viola player? Want to play in an all viola ensemble?!? 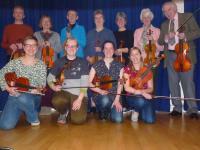 This viola ensemble is for adult players who want to get together to play great music, just for pleasure, in a friendly and supportive group. Rehearsals are relaxed and informal with an ethos of helping each other and sharing technical and musical advice in order to achieve the best outcome. We will work on a number of pieces each session in a variety of styles, including arrangements and original music for viola ensemble. The ensemble is open to adult viola players approximately Grade 5 standard and upwards (but do get in touch if you are keen and interested but unsure about your suitability). This is an ideal opportunity to gain experience in ensemble playing if you feel overwhelmed at the thought of orchestral playing, and offers a chance to meet like-minded people and get to know other viola players. 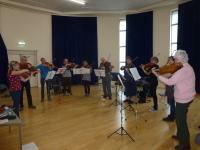 There's nothing quite like the sound of an all viola ensemble! Rehearsals are approximately once a month but there is no commitment to attend every rehearsal: come when you can! However, attendance must be pre-booked so that appropriate music and parts can be selected in advance. Please visit the webpage for details of our next rehearsal.